It happened on Kachina Peak - the highest lift served terrain in New Mexico earlier today. Two people were dug out, and others are feared still buried. I’ve heard that they are using 30 foot probes and are not hitting bottom. The peak opened yesterday for the first time this season. Well apparently, one of the two skiers taken from the hill yesterday has died. Serious in bounds avalanches are pretty rare. The last one that I can recall that resulted in a death was a late season slush slide off the Pali lift at A Basin maybe 10 years ago. That’s terrain that only recently got lift service. Had been hike to only until a couple years ago. What next, build lifts to Highlands Bowl? Might as well at this point. Dang. They said they were doing avalanche mitigation in the area too. Wonder if that got missed, or it was a remnant that hung on from a previous controlled avalanche? Latest report by the local news. Huge slide debris field. Lift 4 was closed today. Very sad. Victim was a young man from Massachusetts on holiday with his father. Expert skier who started skiing at age 4. RIP. In bounds avalanches are kind of the worst fear of us recreational skiers. There are a few places I’ve felt some avi anxiety in recent years. First time I skied Highland Bowl at Aspen Highlands my son and I went in different directions. I waited for him for about 10 minutes at the base of that huge bowl. There are very high and steep mountainsides of snow on three sides as you stand there. The potential for avalanche is very real at certain times. After ten minutes I decided I’d find a different spot for a rendezvous. Last winter I skied Delirium Dive at Sunshine/Banff ski area. It’s quite steep and is restricted to folks with avi probe/beacon eqmt only. As a consequence the snow in there does not feel super consolidated. There is an eerie quiet to the place and I felt an urge to keep moving and get clear of the steepest section promptly. Kachina Peak is the round peak to left in this photo from Taos. I took this pic before they put the new chair in. Everything is quite steep off the ridges up there. The skier in the center of this shot from Arapahoe Basin is skiing a cliffy, tree run called West Turbo. A few hundred yards beyond and out of sight, but similarly steep, is a run called David’s, named after a guy killed there in an in-bounds avi in the spring of 2005. Unfortunately, the second victim has also died. The family donated organs. He was 22 with connections to Colorado and MN. 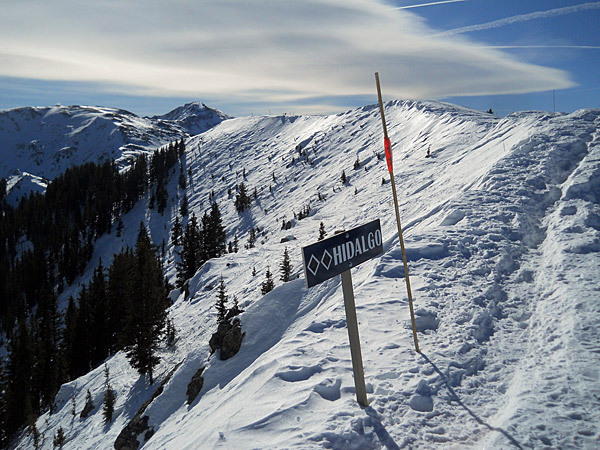 Folks might want to rethink the long time general rule that beacons are only needed for skiing back country or runs where signs clearly reccomend their use. Any terrain over 33 degrees can break loose under unfavorable conditions. My instructor last week noted that he’s been wearing his beacon a lot more even when staying in-bounds. He also observed that he hadn’t seen any back country tracks since the avalanche on Kachina. Folks around Taos are naturally a bit wary of the snowpack right now. Hard to say when Kachina Peak will re-open. Lift 4 did open for backside access after MLK weekend. It was open for a few hours on Sat and Sun afternoon but not in the mornings even though that made the frontside pretty crowded with Texans on holiday. Outside online had a good article on this. 01/29/2019, Resort Skiing Is Dangerous. And It Always Will Be. Here’s a primer, with an apology to the avalanche professionals out there for dumbing it down. Most deaths—inbounds and out—are attributed to what are called slab avalanches, as opposed to loose or wet slides. In simple terms, a slab is a layer (or many layers) of consolidated snow on top of a layer (or many layers) of unconsolidated snow or icy crust. When you hear ski patrol blasting during or immediately after a storm, they’re typically concerned with what are known as surface or storm slabs. The fear is that the new snow layer isn’t bonded to the surface snow beneath it. The last time I skied Taos was a few years before Kachina chair went in, but I skied terrain close to where it was installed. Taos is generally a dang steep mountain and I’m sure the Kachina chair represents some of the most elite expert lift-served terrain anywhere. 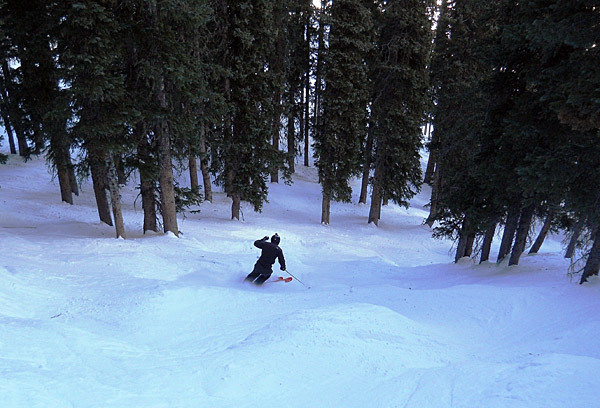 Hopefully, your odds of getting caught in an inbounds avi are much, much less on more common lower angle resort runs. But what does this mean for Taos and Kachina? The inbounds avi at Arapahoe Basin in May 2005 forever changed how they conduct spring skiing. The Pali chair used to stay open to the bitter end or close to it. Now they shut it down earlier than other parts of the mtn to hopefully avoid risking lives in a big spring slide. Taos will have to come up with a new regimen for Kachina Chairlift operations and, just guessing, I wouldn’t be surprised if they wait until next season to allow use of it again? 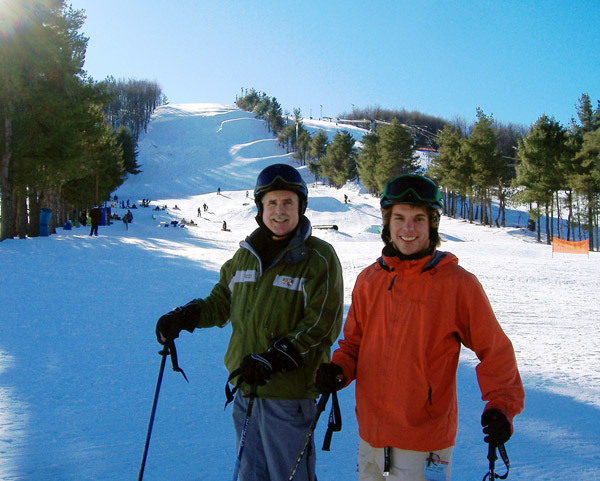 Interesting mid-Atlantic trivia: In Nov/Dec 2008 there was a most unusual “Eastern avalanche” of manmade snow that occurred at Wisp, MD on their steepest trail, The Face. I was there in mid-Dec after it happened when a patroller told me then that they had a testy situation. The run sustained not one, but three slides since the season began. The first big one occurred about three weeks before my visit when a five foot thick slab of snow about the size of a football field slid hundreds of feet down the slope. Fortunately, the slide happened when nobody got in the way. An active slab of that moderate size, even in a very constrained situation, would NOT be fun to encounter! With all good intentions Wisp had made an incredible amount of early season snow on The Face, but sandwiched somewhere in between was a one foot layer of loose, unstable natural snow. At the time of my visit The Face run was still closed awaiting an especially demanding grooming job. It’s hard to see in this photo, but just to the left of my noggin is a large divot in the snow where the 2008 Wisp slide(s) occurred. The inbounds avi at Arapahoe Basin in May 2005 forever changed how they conduct spring skiing. The Pali chair used to stay open to the bitter end or close to it. Now they shut it down earlier than other parts of the mtn to hopefully avoid risking lives in a big spring slide. Taos will have to come up with a new regimen for Kachina Chairlift operations and, just guessing, I wouldn’t be surprised if they wait until next season to allow use of it again? The A Basin slush slide was caused by water flowing under the snowpack - thus weakening adhesion. The Basin has installed sensors to detect that flow. When the sensors sense it, Pali is shut down. So the area determined the problem and took appropriate action to insure it would not happen again. Taos will likely go thru a siimiliar investagative process. I had never heard about an in-bounds avi in the mid-atlantic, very interesting. I did see some large ‘cracks’ in the snow pack at the top of Gandy Dancer at Snowshoe last year, which was interesting to see. I imagine if the layers of snow were not well adhered to each other you may have seen the same thing there.